MOSCOW (AP) If there is one flaw in Lionel Messi’s genius, it might be his failure to score penalty kicks in big games. At least Messi’s miss in the 64th minute at Spartak Stadium – his fourth in his last seven penalty attempts for his club and his country – was not in a losing cause. A 1-1 draw with impressive World Cup newcomer Iceland is far from a fatal blow to Argentina’s chances of advancing from a well-balanced group that also includes Croatia and Nigeria. The day after Cristiano Ronaldo scored three times from three shots on target – including a penalty and a spectacular free kick – to salvage a point for Portugal against Spain, Messi’s tally of 11 shots, only three on target, and no goals was curious. 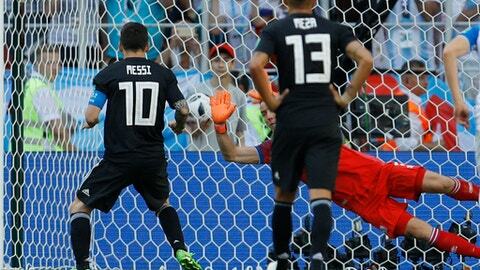 ”That’s just another statistic, it’s part of the past,” Argentina coach Jorge Sampaoli said of Messi’s latest miscue. Iceland was level four minutes later, however, when Alfred Finnbogason scored after Argentina goalkeeper Willy Caballero pushed a low cross into the forward’s path for a volley from eight yards. Iceland also protected Halldorsson with swarming runs and tackling to shut down Messi and Argentina’s attacking lanes. ”Are you Cristiano Ronaldo’s uncle?” Halldorsson said to a reporter who asked why Iceland celebrated so much for a draw. Ronaldo criticized Iceland the same way after Portugal’s 1-1 draw in Iceland’s Euro 2016 debut. ”Maybe we needed to be more creative in the first half. We were very slow on the ball,” Sampaoli said. Thousands of Iceland fans did their ritual claps and war chants of ”Huh!” during the game and after the final whistle with their players. But they were massively outnumbered in the 45,000-capacity stadium by Argentina fans, and Iceland coach Heimir Hallgrimsson did not understand why. ”Strangely, we had difficulties in buying tickets,” he said. ”I can’t see where all the Argentinians bought their tickets. Because we could have sold much more in Iceland.